If you’re unfamiliar with COP23, it’s the United Nations Climate Change Conference attended by ministers and heads of state in Bonn this week. For reference, COP21, held in Paris, culminated in the Paris Agreement, where 196 parties reached consensus, forming a collective initiative to limit global temperature rise to below 2 degrees Celsius above pre-industrial levels. But we’re already falling short in terms of commitments from different governments to implement the policy changes we need in order to stay under the 2 degrees bar. The message at COP23 is clear – it’s being left to corporations and non-government or private stakeholders to pick up the slack left by policy-makers. Corporations are taking control of their energy supply. The leading tech companies like Google and Amazon and Microsoft are leading the charge by participating in corporate PPAs (Power Purchase Agreements) that allow them to procure their energy directly from renewable sources. We expect to see an increasing trend in companies across the world following suit. Corporate PPAs remove the drivers for renewable energy investment from the hands of the policy-makers and places it in the hands of corporates, and eventually individuals. In order to finance an energy project, a solar farm, wind farm, gas plant, or nuclear plant typically needs to secure a PPA. It’s a promise someone will purchase the power generated in the future, which enables the generator to secure funding to construct the assets. It means energy companies and IPPs can ensure they have a customer before breaking ground and embarking on an installation. In the past, the typical PPA was provided by the power utility companies who had access to customers to sell the power on to, acting almost like a middleman. The corporate PPA enables renewable energy generators to bypass the utility company and go direct to the end customer and provide a contract for whatever energy they need. This has several benefits for reducing transmission costs and losses and improves efficiency. The move towards corporate PPAs will circumvent government-level policy and manage energy through private channels. The hope is that will see some kind of democratization in the same way that the Internet democratized access to information. Starting with the industrial commercial customers then moving down towards SMEs and finally to individuals. The development of these corporate PPAs is the start of a movement that will trickle down until the whole of the energy industry is run in a more streamlined and efficient peer-to-peer fashion. Companies like OpenUtility are already making progress by providing a platform which effectively enables individuals to have the equivalent of a corporate PPA with the wind farm down the road from your house. Over the next five to ten years, with technologies like peer-to-peer platforms (P2P) and blockchains, it will be increasingly common for individual consumers to buy power directly from clean energy producers. This will create clear demand profiles from industry, business and individuals that will dictate the type of energy plants and operations that are developed, permitted and invested in. It’s a dramatic shift from the traditional energy paradigm where a few centralised energy suppliers controlled the whole supply chain and the consumer had little choice where their energy came from. Giving consumers the choice of what technology and where they purchase their energy from democratizes the supply curve and fragments the market. As a result, a kind of Darwinian economics replaces the old energy suppliers and the market, rather than policy, will drive the system. The positive message is that in 10 to 15 years, whatever happened at COP becomes almost irrelevant because private enterprise and private individuals will drive down carbon emissions and energy costs without the decree of government bodies. This democratization of energy procurement and distribution extends to municipalities, towns, and cities who will be able to go directly to the source of energy to procure the power based on the demands and requirements of their citizens regardless of national policy-makers. Voters will vote in those politicians that heed their wishes to procure their city’s power through renewable sources. But why are corporates opting for green energy procurement direct from suppliers and doubling down on renewables whereas governments are holding off? In one way, corporate social responsibility underlies the motivations for corporations to invest in renewables but they also see the rapid declines in the costs of renewables like solar and wind which are now below parity with traditional energy sources. Yes, it’s good for the brand and aligns with consumers. But it’s ultimately an investment in the long-term. Investing in renewables provides energy security and reduces the downside of more frequent extreme weather events that affect business and send insurance policies through the roof. Warren Buffett’s Berkshire Hathaway, for example, is on course for its first annual insurance underwriting loss since 2002, after taking a $3bn hit from the recent run of natural disasters. It’s an investment that helps reduce disruption to business. 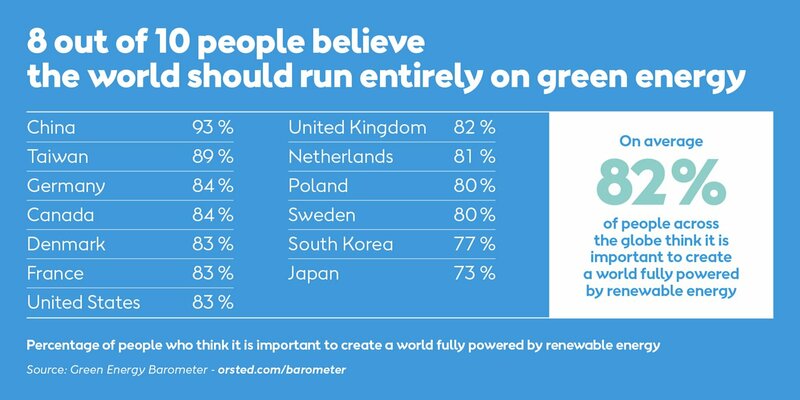 Orsted recently surveyed 26,000 participants and found that on average, 82% of people around the globe advocate a world powered by green energy. And whilst governments might not be listening, corporations are. To date, 116 Companies have pledged to go 100% Renewable, including Ikea, Adobe, Akzo Nobel, Apple, Aviva, BT, Diageo, Facebook, Google, Microsoft, and Nike. Those that have entered into a corporate PPA is approximately 50 today but, the total number of companies estimated to procure their power in this way is set to increase to more than 50,000 over the next 5 to 10 years. (Gary Demasi, Global Director of Data Center Energy and Location Strategy, Google. At RE-Source 2017). The old model of centrally controlled energy distribution is becoming obsolete. Traditional industries are racing to keep all of their customers and avoid being left out of the loop. To stay relevant, utilities are becoming more like service businesses with a behind-the-meter business model. If you’re a big industrial commercial customer who has on-site power generation, the utility will buy your power generation assets and sell you a service contract to operate them to ensure power delivery. It works (for now at least) because, they have vertical integration of engineering resources and the economies of scale needed to be competitive in that type of energy services landscape. We are moving from a world of centralised energy control and racing at 100 miles an hour towards a world of completely decentralised energy with very few major centralised power generation facilities. Centralised power will be reserved for emergency backup and load balancing. In the future, even that will become obsolete. When we have a network of batteries and electric vehicles, they’ll replace gas and coal plants as a backup source. We’ll be able to borrow the power from batteries, homes, and cars. Hydro will act as a large-scale battery to backup the base load. The exciting part of this is that we are able to take energy buying and consumption patterns out of the hands of the incumbent industries and policy-makers, which makes it possible for corporations, businesses, and individuals to take responsibility for the types of energy they consume and reflects their preference for renewables.